When it comes to buying a 300cc Scooter or 300cc Moped to trust with your life; WHO you buy from is just as important as WHAT you’re buying! Please CLICK HERE to understand why. Meet the bad boys of the Joy Ride Motors’ scooter family: our 300cc scooters and mopeds. Want to make a statement while still getting plenty of torque and power? 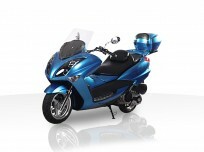 Then take a ride through our selection of 300cc mopeds and 300cc scooters for sale. Built big and strong to carry two riders, along with a surprising amount of storage under the seat and in the secure luggage boxes our 300cc scooters easily reach up to 70+ MPH, allowing you to cruise around town and on the freeway or highway too (something our 50cc scooters can’t really do, unfortunately). But let’s get back to that cruising around town part. See the looks of all the other drivers stuck in their cars in the middle of traffic. Those looks are pure envy – the frustrating feel of knowing they could be done with traffic if they were you. But they don’t have one of our 300cc scooters, so instead they’re just stuck, sitting, wishing they were you. 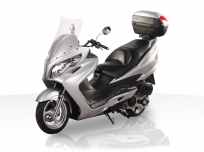 In our 300cc scooter catalog below, you’ll find our most popular sellers from; BMS Scooters, Roketa Scooters, and Ice Bear Scooters, which all have a proven track record for safety, quality and performance. We ‘cherry pick’ the very best models from all our vendors’ product lines, which come fully assembled, for the best price online. So when you pull up to work, school, your apartment, the bank, wherever – and park right in front and step into your destination, not only will you get those looks again, but you’ll empowered. Smile with pride that you made the smart choice of buying a scooter from Joy Ride Motors, and now you’re reaping all the benefits! 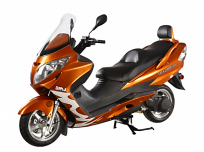 Some other benefits of our 300cc scooters, 125cc scooters, and 150cc scooters are that you can save big money on gasoline, registration, maintenance, insurance, and parking costs. These amazing scooters get around 80 miles per gallon of gas and are available at some of the lowest prices on the net. Call one of our friendly and well-educated representatives at Joy Ride Motors now, toll-free at 877-300-8707, and let us know what it will take to get you on one of our incredible 300cc scooters or 300cc mopeds for sale! 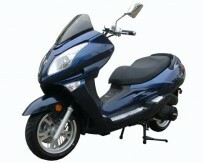 We will be more than happy to answer any and all of your questions regarding our scooters and motorcycles.